Nimba has a positive effect on pupils as well as employees. It is not only the pupils that are happy with Centre Nimba, the employees too. Manager Mama and teacher Soumah would be able to find work somewhere else. For the other employees, however, this would be a serious problem. Guinea has a high rate of unemployment and in the past year prices have increased considerably. Fortunately, we were able to raise the wages by 20,000 Guinea francs, which amounts to 8 euro per month. This equals the price of half a bag of rice! 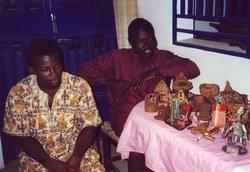 Last year we employed Maître Traoré, the shoemaker. This year we employed Sonah, who teaches handicraft. Like our tailor, Sonah is handicapped. She lives close to the school and has a better future.